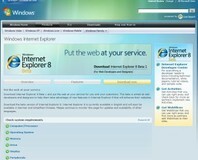 If you're waiting with bated breath for the final release of Internet Explorer 8 – the very first Internet Explorer revision to actually follow web standards instead of just making things up as it went along – the good news is that you might have your wishes granted before the year is out. With the first beta having been received well by techies the world over since its launch in March, people have been looking forward to the full release of the popular in-built web browser for Windows. While there's still a way to go, with second beta due some time next month, it's good to see that the upgrade is still on track for a release before 2009. While Veghte hasn't ruled out a third round of beta testing, at least it won't drag on and on. Many developers are looking forward to the new browser thanks to a 'strict compliance' mode, which forces Internet Explorer to ignore all the half-standards Microsoft has created throughout the years and render websites in the same way as more traditionally standards compliant browsers like Opera do. While this is likely to cause a bit of heartache for those web developers who have come to rely on Internet Explorer-specific coding to make their site the prettiest around – although an 'Internet Explorer 7' mode will be available for these cases – it spells better interoperability for the web as a whole, and personally is something I'll be applauding Microsoft for come the Release To Manufacturing. Does anyone here use the first beta as a day-to-day web browser, or is Microsoft going to have to pull something special out of the hat between now and launch to tempt you away from those third-party browsers? Share your thoughts over in the forums. A new feature has been added to Google Labs called Mail Goggles, designed to prevent those late-night inebriated e-mails from ever being sent.